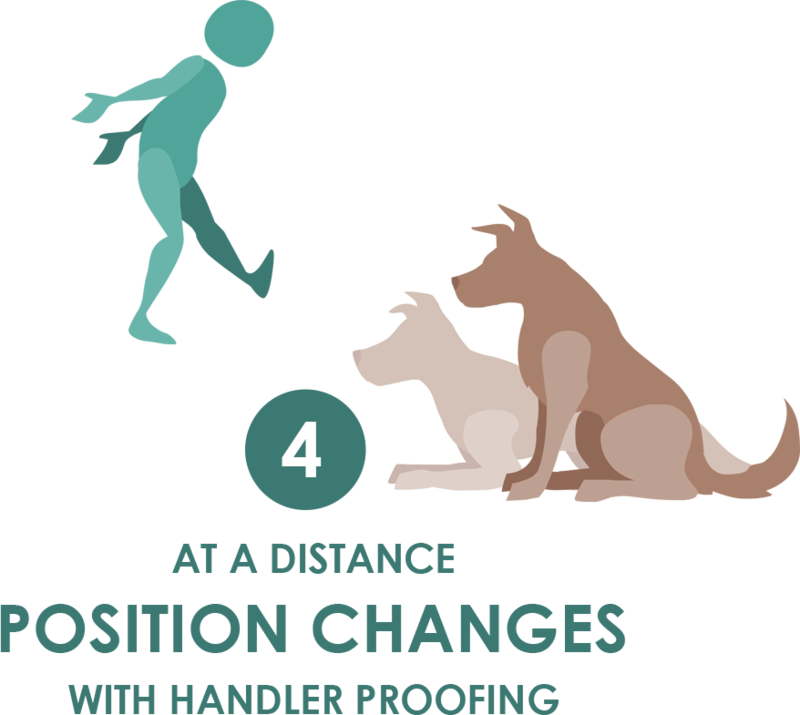 Two position changes at a distance with handler proofing. Dog demonstrates any two positions at 20 ft. (6 m), while the handler assumes different (unusual) positions. Use of a target is optional. Purpose: Demonstrate distance control, cue discrimination and fluency. Equipment: Optional: a target such as a platform, mat, box, or other foot target. Exercise set-up: Dog is either placed or sent 20 ft. (6 m) from handler (use of target is optional). If placed, the handler then walks 20 ft. (6 m) from the dog. The dog may begin in any position. The exercise begins when the handler is 20 ft. (6 m) away and facing the dog. The handler then assumes the first unusual position — for example, lying on the ground — and then gives a single cue to sit, down or stand. The handler then moves to a second position — for example, sitting in a chair — and gives a single cue to the dog for a new position. The exercise ends after the dog and handler have completed the second position. Non-qualifiers: Dog does not respond to the first cue for each position. Dog moves before handler gives a cue. Handler does not take a new position for each cue. Handler is less than 20 ft. (6 m) away. Dog moves by more than one body length towards handler as he/she changes positions. Tip: Your dog only has to show two positions; pick your best ones!